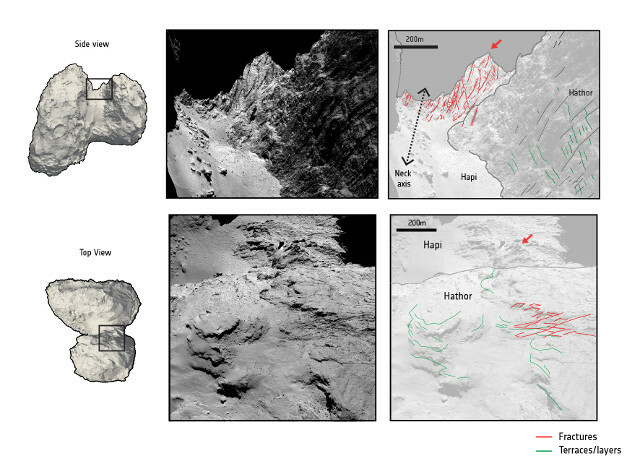 An article published in the journal “Nature Geoscience” shows an analysis of the erosion processes that have generated deep fractures and faults in the nucleus of comet 67P/Churyumov-Gerasimenko. A team of researchers led by geologist Christophe Matonti of the Aix-Marseille University, France, examined images captured by ESA’s Rosetta space probe’s OSIRIS camera to perform a geological and morphological analysis identifying two fracture formation processes. According to the researchers, surface fractures are generated by temperature changes while the deeper fractures are generated by shear stress. Various telescopes such as the Hubble Space Telescope, the SOFIA flying telescope and the ALMA radio telescope were used to examine the innermost region of Comet 46P/Wirtanen, nicknamed the Christmas comet because in recent days it made an Earth flyby. This expression has to be considered in a broad sense since it reached 11.6 million kilometers (more than 7 million miles) on December 16. This was enough to obtain interesting information such as the detection of hydrogen cyanide molecules in its nucleus by ALMA. 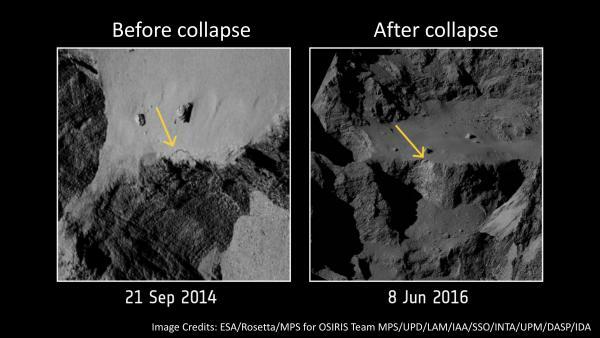 An article published in the journal “Icarus” describes a research focused on the link between landslides and avalanches with the long-term activity of the comet 67P/Churyumov-Gerasimenko. Jordan K. Steckloff and Nalin H. Samarasinha of the Planetary Science Institute examined data collected by ESA’s Rosetta space probe in the course of its mission to conclude that those phenomena occurring on the surface of the comet, with the resulting waste of mass, are a key to keeping it active in the long term. 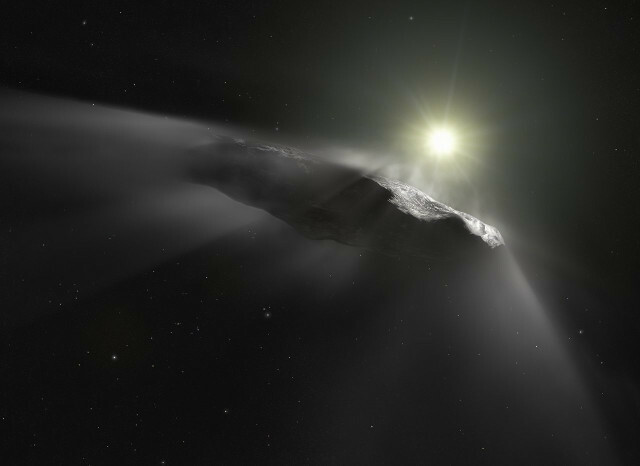 An article published in the journal “Nature” describes a research on the interstellar asteroid 1I/2017 U1 ‘Oumuamua whose authors believe that after all it’s a comet as its discoverers initially thought. A team of researchers led by Marco Micheli from the ESA SSA-NEO Coordination Center in Frascati, Italy, used observations made with the Hubble Space Telescope and various ground-based telescopes to follow ‘Oumuamua’s trajectory finding that it was different from the one calculated taking into account the various gravitational influences. The conclusion is that there’s a cometary activity that generates an additional boost. 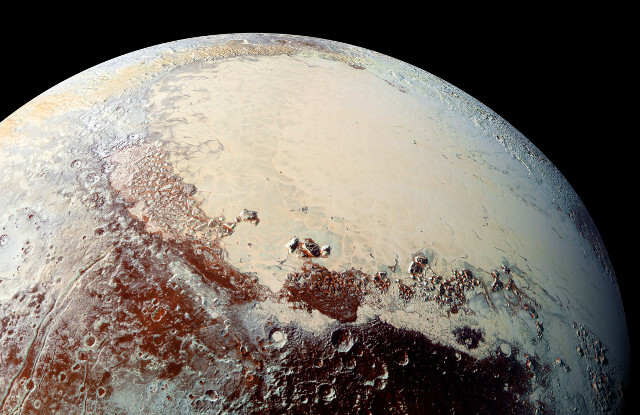 An article published in the journal “Icarus” describes a research that offers an explanation for the formation of the dwarf planet Pluto. A team of scientists from the Southwest Research Institute (SwRI) put together data collected by NASA’s New Horizons space probe and data collected by ESA’s Rosetta space probe, which studied comet 67P/Churyumov-Gerasimenko, concluding that Pluto formed by the union of about a billion comets similar to it.